We take for granted that our political leaders and royal dignitaries automatically possess the skill for public speaking and expert eloquence of the spoken word. Little do we realize that speechwriters and elocutionists are standing at the ready behind the scenes advising the advisor. One such historical figure, King George VI, or known as Bertie in close family circles, relied more on his speech therapist more than any of his various consultants to overcome a lifelong speech impediment of stammering. An everyman and dutiful husband, Bertie (Colin Firth) becomes an unreluctant king when the death of his father, King George V (Michael Gambon), was inevitable in December 1936. However his older brother David (Guy Pearce) was next in line as heir to the throne. But when David’s personal scandal erupts concerning his engagement to a tawdry American divorcee, he is forced to abdicate the throne role to young Bertie, rushing Bertie’s status as authorial figure. This is when the supportive wife steps in, who eventually becomes the royal highness herself, Queen Elizabeth (Helena Bonham Carter). Employing the services of Lionel Logue, an unorthodox and controversial speech therapist, she too realizes, that scrutiny and the public eye will be fierce if appearances aren’t kept up. As historically period biopic go, there is usually adversity that protagonists go through and some central savior as the hero. In this case, Logue (Geoffrey Rush) is the “Rain in Spain” of Professor Higgins to Eliza Doolittle’s Bertie. Alluding to that story of Pygmalion, the professor attempts to rid Eliza’s thick and shrill Cockney tongue and transform her into a refined society lady of gentility and articulation. With similar results, Logue has the future King drill through a series of physical and speech exercises to eliminate that distracting stammering. To be king and not being able to communicate effectively and persuasively in public would be seen as a weakness for the monarchy. He vents this frustration to Logue since public speech is not his specialty. But the end result, he needs to be perceived as a person of power and influence. Logue sees right through to the end because you can feel and see his methods eventually working its magic on Bertie. Colin Firth displays such immense detail and acuity for how the real king may have stammered and stumbled upon his communication. But occasionally, you feel as though the actor comes out of the character, rather than the actor immersing himself in the character. During a scene of one of the initial therapy sessions, Bertie is reciting a line from Hamlet. After stumbling through a line reading, Lionel has him recite it again, but while wearing earphones playing loud classical music. When we hear that recitation later on, it’s meant to be a spontaneous revelation. Unintentionally it sounds like an actorly Colin Firth. Geoffrey Rush is a treat to watch as the eccentric, but determined speech therapist. Rush’s patience and drive is what drives Logue to serve as the surrogate authority and influence that this film makes him to be. Helena Bonham Carter plays her Queen Elizabeth as a formidable and thoughtful type, instinctively knowing that her husband will persevere. Director Tom Hooper knows a thing or two showcasing historical detail. He’s proven his chops by presenting ambitious fact-based miniseries and newsy occurrences like John Adams and The Damned United, respectively. 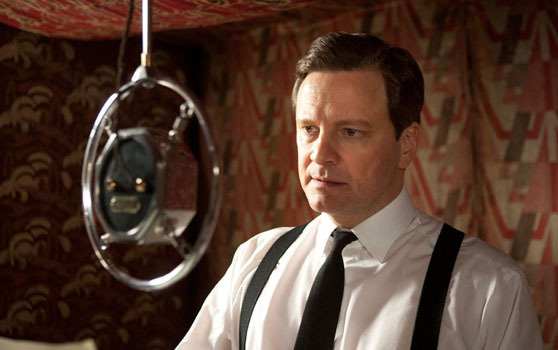 By elevating such a minor topic and making it into a substantial piece of human interest, Hooper crafts The King’s Speech into an esteemed piece of visual storytelling. Most other based-on-fact historical dramas are dry and straightforward. Not so much here. A historical biography about one aspect of the early years of young Bertie’s life, this is one award-worthy story that is not preachy, but will truly fascinate. Note: The original audio of the 1939 war speech by King George VI can be heard on the official film website, www.kingsspeech.com. Scrooge is Humane in ‘A Christmas Carol’?